Magnesium stearate, maize starch, hydroxypropylcellulose (E463), colloidal silica, sodium lauryl sulphate. The tablet coating contains propylene glycol,sunset yellow (E110), quinoline yellow (E104), titanium dioxide (E171), methylhydroxypropylcellulose (E464), purified talc (E553). it clears skin initially i had no side effects at all easy to take your acne becomes resistant to it after a while results are only temporary doesnt do much for oily skin or comedones I have used this antibiotic in the past for cystic acne. It took a good 3-4 months before I even noticed any change but in the 5th month I was all clear. During this time I still had excessively oily skin, but I would try to cover that up with powder during the day. The clear skin lasted only for about 3 months and then after this slowly I started breaking out in little inflammatory spots, then eventually they became full blown cysts again. I regret not using a topical with this antibiotic because I think I could of maintained the clear skin for longer if it wasn't just relying on the antibiotics. I have to add the new resistant acne came back even worse than my previous cystic acne and I was truely dissapointed. These new cysts were deeper and more harder to treat. In the end I eventually got rid of them with isotretinoin. Bottom line is this antibiotic will work for you if you have not used it before and provided you don't have any resistance. But eventually your spot causing bacteria grows an immunity and becomes resistant to this antibiotic, so it's best to use it in conjuction with another treatment. Antibiotics are only a temporary solution to a chronic condition. Have to take them on an empty stomach and you can't take dairy 2 hours before or after taking them. (However, I feel this is a small price to pay for the benefits I've already seen.) Fades acne, dramatically reduces the amount of spots/breakouts you get and no horrible side effects at all. 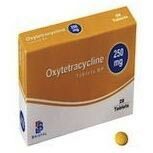 I was prescribed Oxytetracycline 250mg tablets from my doctor. I take 2 in the morning and 2 at night. I have been on them for around about a month now and I am so impressed. My acne is so much calmer and barely noticeable. It has dramatically reduced the amount of spots/breakouts I get and I will definitely be continuing with them to see how much better my skin gets in another month. I recommend them, it's worth a try! Persevere. Reduced acne slightly Reduced number of breakouts Didn't clear all acne Have to take on empty stomach I was perscribed this by my doctor after Erythomycin didn't have an effect. It helped reduce the number of spots and breakouts, but has come nowhere near clearing it completely.